Photo courtesy of Susan Ellis, Bugwood.org. There are thousands of wasp species in North America, most are solitary and do not live in colonies, but there are also a number of social wasps. 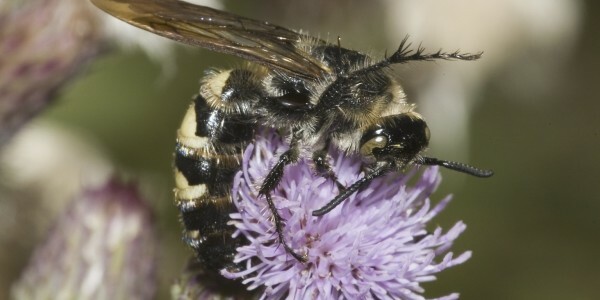 The common social wasps include the yellowjackets, the bald-faced hornets, and the paper wasps. They all have an annual colony cycle (survive for only 1 year) and construct their nests from a paper-like material. The nest may be constructed in the ground, attached to tree branches or bushes or built under the eaves of houses. Their diet consists of insects and nectar from flowers. After mating in the fall, females will find a place to spend the winter until they can establish a new colony in the spring. While most wasps don’t have the body hairs necessary to carry pollen from flower to flower, many of them visit flowers to feed on the nectar and help to distribute pollen. Many solitary wasp species can also be found visiting flowers to feed on nectar, and there are even some pollen-collecting wasps in the western part of the country. The most interesting and well known pollinating wasps are the fig wasps, the primary pollinator of fig trees which have life cycles closely intertwined with that of their host fig tree. Social wasps will defend their nest if it is disturbed or threatened. Stings from a wasp can be very painful, and those with sensitivities to insect stings may be at risk for an allergic reaction.